Of all cuisines, Arabic food has the best salads. We’re not making claims here, we’ve got proof. Go to any Arabic family dinner and you’ll find at least 6 to 10 types of salads, all different from one another. They are fresh, healthy, filling — basically everything that we trying-to-eat-healthy generation wants in their daily diet. These wholesome bowls of deliciousness are one of the many reasons that the past decade has seen Arabic cuisine's global profile skyrocketing. Since the sweltering heat outside has kind of killed our appetite for anything scrumptious, here are some creative ways to eat more salads and stay in shape — Arab style. If you're sceptic about eating eggplants for a salad then you haven't tried baba ghanoush — a rich, smoky and creamy salad dip made with a slow emulsion method for the ultimate dippable texture. This salad is a combination of tangy and sweet with a minty dressing and simple salad fixings with pita chips to add crunch. Tabouleh is officially the champion of Arabic salads and we can see why. 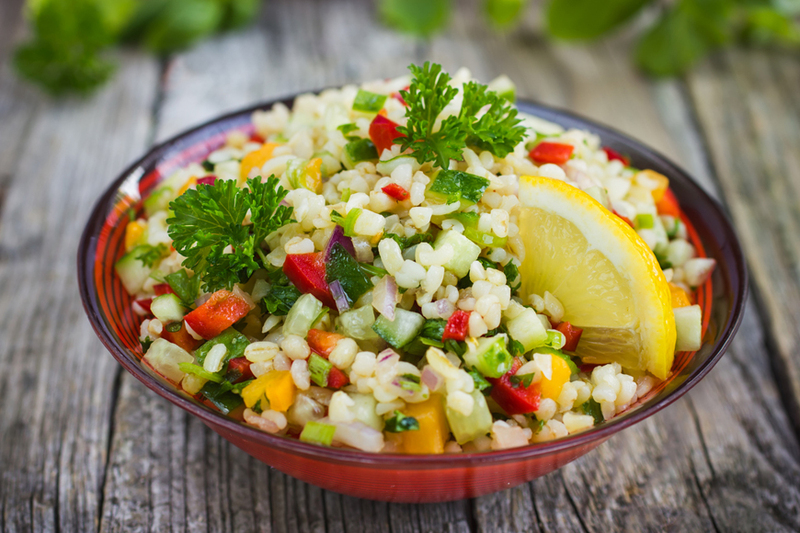 A heavy chop of refreshing parsley with bulgur, tomatoes and cucumbers with a lemon vinaigrette - you've got the ultimate salad to please your taste buds and gut health. This Syrian way of serving a summer-fresh salad has fava bean and chickpea mixed with fresh tomatoes and parsley. Perfect with warm pita bread! Crispy, seasoned roasted chickpeas in a yummy salad and a hummus-dill dressing. We're all in for this kind of healthy. The only work required here is chopping the cabbage, the rest is a piece of cake. Add olive oil, lemon juice, and salt to make this salad. After that, you can add whatever you like: tomatoes, onions, cucumbers, radishes, beets, carrots, etc. A simple and easy Middle Eastern salad that comes together in just minutes. It's piled high with fresh veggies and leaves you feeling healthy and satisfied.